Samsung has made it official: Its 7-inch Galaxy Tab 7.0 Plus will arrive at U.S. retailers on November 13. Pre-orders start Oct. 23. The Wi-Fi-only Plus model with 16GB of storage will cost $400 at Best Buy, Amazon, Tiger Direct, Fry's and other retailers. Samsung's Friday announcement didn't mention price and availability of other Galaxy Tab 7 Plus models with 32GB and/or cellular connectivity, although it's likely they'll arrive shortly. The Tab 7.0 Plus packs some impressive specs, including a speedy, 1.2GHz dual-core processor; 1GB of memory; the Android Honeycomb 3.2 operating system; a 1024-pixel by 600-pixel, 7-inch color display; a 3-megapixel back camera with LED flash and HD (720p) video recording; and a 2MP front camera. It has a whopper of a price tag too, at least when stacked against new 7-inch color slates such as the Amazon Kindle Fire and Kobo Vox, both of which are only $200. Yes, half of what the Galaxy Tab 7.0 Plus costs. Is the pricing an apples-to-oranges comparison? Not really. At least not from the perspective of everyday consumers, most of whom aren't well versed on the virtues of dual-core chips, not to mention the advantages of Android 3.x (or 4.x) over Android 2.x. Neither the Kindle Fire nor the Kobo Vox has a camera. 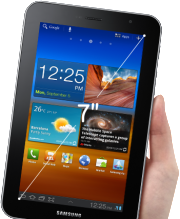 And the Galaxy Tab 7.0 Plus, with its 1.2GHz dual-core processor, is bound to be faster. The Kindle Fire has a dual-core processor, but Amazon hasn't revealed the chip's clock speed. The Vox has an 800MHz single-core CPU. The Galaxy Tab 7.0 Plus has 16GB of storage; the Kindle Fire and Kobo Vox each have 8GB. Still, it's hard to justify a $400 tablet when perfectly respectable $200 slate--which, by the way, lets you read ebooks, watch movies, listen to music, play games, run apps, browse the Web, and check email--has most (if not all) of all the features you'd want from a tablet. True, some users may want a front and back camera--or at least a front camera for video chat. But that's probably not a checklist item for most folks. After all, your smartphone has a pretty good camera already, right? Fierce competition is driving down the price of tablets, and that's great news. The Galaxy Tab 7.0 Plus is a quality piece of work, but it may be too fancy for its own good.